Gold inlaid Winchester Model 1886 takedown rifle in unfired condition, made for John F. Dodge, co-founder of the Dodge automotive company. Photo courtesy James D. Julia, Inc. The Cody Firearms Museum at the Buffalo Bill Center of the West houses one of the most remarkable collections of firearms in the world and features more than 6,500 historically significant firearms dating from the mid-1400s through the present day. With the Wes Adams Firearms Collection, we were honored to exhibit firearms from a remarkable private collection. 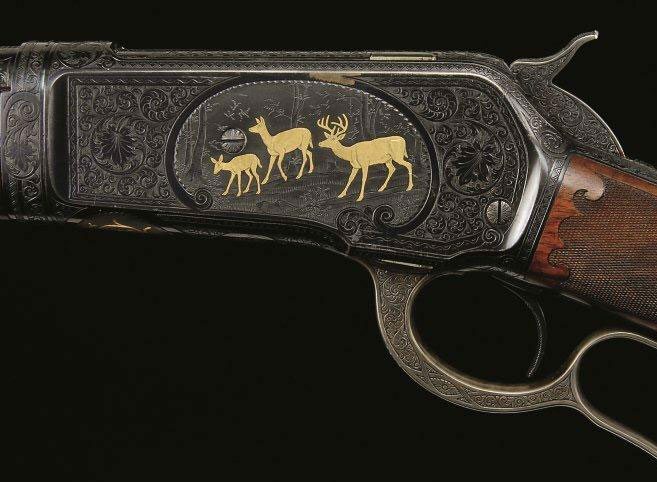 A Savage Model 1899 Monarch Grade Lever Action Rifle engraved by Master Engraver Enoch Tue. Photos courtesy James D. Julia, Inc. The exhibit opened in April 2012 and ran through early 2013. It showcased selected examples of extraordinary guns from the renowned private collection of Wes Adams of Nevada. An amazing man, the late Wes Adams was born in Vernal, Utah, to a rancher’s daughter and a jack-of-all-trades father. He had a very modest upbringing, and as a teenager moved to Las Vegas, where he worked in the construction industry. A brilliant mind, ambitious nature, and relentless pursuit of excellence led him to become one of the most prominent and successful developers in Nevada. Adams’s deep and passionate interest in firearms enabled him to amass, in only about a decade, one of the finest collections of collections of Winchesters and probably the finest collection of Savage firearms ever assembled. He was incredibly adroit in acquiring rare and premium firearms. A gold inlaid Winchester Model 1886 takedown rifle in unfired condition, made for John F. Dodge, co-founder of the Dodge automotive company. Among the guns displayed was a superb gold inlaid Winchester Model 1886 takedown rifle in unfired condition, made for John F. Dodge, co-founder of the Dodge automotive company. The special engraving was executed by Winchester Master Engraver John Ulrich, who used 195 grams of gold in his artistry. The carving and checkering of the stock were done by his equally famous brother, Conrad Ulrich, also a Winchester Master Engraver. Other guns included in the display were a lavishly embellished Savage Model 1899 rifle, an extremely rare Winchester Presentation Briggs Patent Lever Action Rifle, and a comparably rare Savage Model 1899 Monarch Grade Lever Action Rifle splendidly engraved by Master Engraver Enoch Tue. Altogether, more than thirty examples of the Adams collection appeared in this special exhibit.